Jawbone UP users now won’t only be able to track their own exercise and rest cycles. They’ll also be able to track the activity of their dogs and see how direct interaction with their pooches affects their own activity graph. Jawbone is partnering with fellow internet-of-things gadget maker Whistle Labs to incorporate its connected dog data into the Up app. Jawbone UP and UP24 users will be able to see any walk, playtime or rest with their dogs directly in their activity stream. Whistle is in many ways an UP for canines. It uses a three-axis accelerometer to track daily exercise and rest cycles, and Wi-Fi and Bluetooth connect the tag to your phone and the cloud. 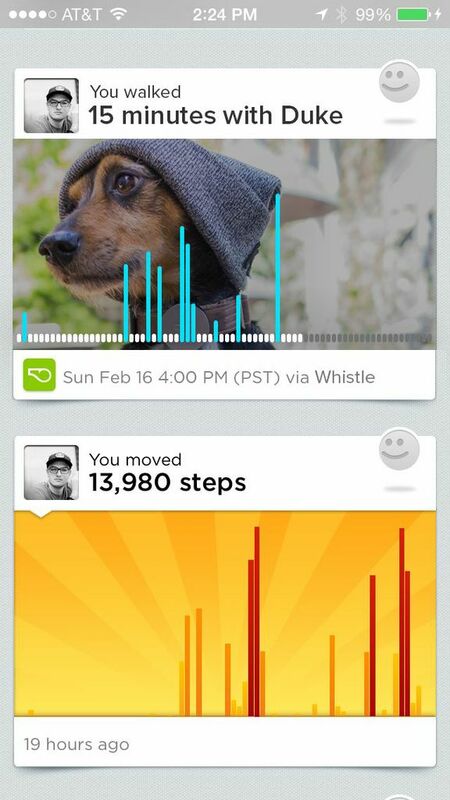 Whistle’s app provides daily benchmarks and graphs of that activity. Much like UP, Whistle generates events in a dog’s timeline, which uses can comment on, customize and share (you can read my full review of Whistle here). We’re starting to see more direct integration of data between different devices on the internet of things, but this one makes particularly good sense if you happen to own a dog. If I weren’t walking my dogs, I probably wouldn’t be exercising at all. Jacobs said right now Whistle’s data is melding with Jawbone’s on the backend through Up’s app integration program, but Whistle’s eventual plan is to create direct connections to wearables and other devices in the internet of things through Bluetooth Low Energy links.